Game day is one of the most exciting days for fans. From the moment a fan wakes up, the only thing on his or her mind is the entire experience of the day and every little detail matters: what attire to wear; where to meet friends for some pre-game food; how early to arrive to the stadium; even which songs to listen to during the drive. And for the most die-hard or superstitious fans, one thing out of place can ruin the day. College GameDay is finally here and Jake couldn’t be more excited. He woke up extra early to partake in the day’s festivities, immediately checking his phone when waking to make sure he didn’t miss any key updates from the Hoos. 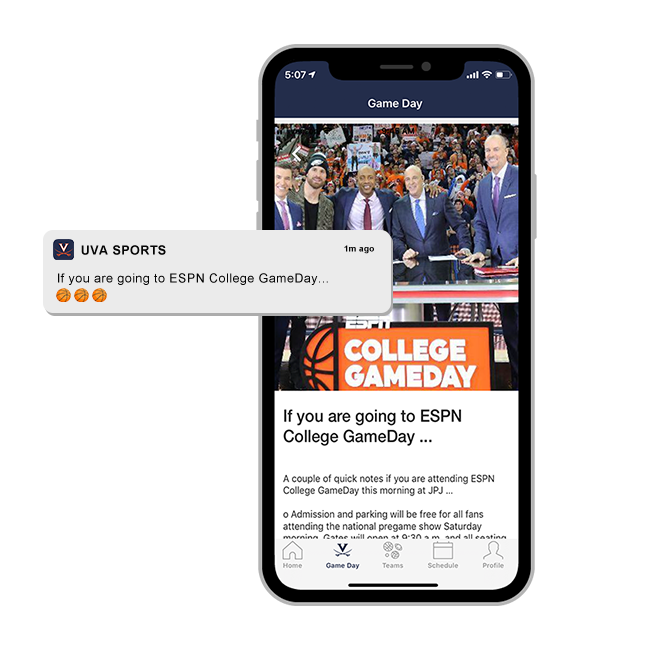 A College GameDay notification from the UVA app told him which entrance to use for the pregame show. “Good thing I checked,” he thinks because Jake typically enters JPJ Arena from a different door. Hours later and a stomach full of wings and beer, it’s near game time. He and his friends head back to JPJ arena, where he must have crossed a geo-fence as he got within a certain distance from the arena because he gets another notification. This time it’s to remind him to use his mobile tickets to enter the venue—one of his favorite things about the app. He never has to think about paper tickets because they are right on his device. While standing in line he checks the starting lineup, views the most recent team tweets and replies to an interactive fan poll right from the app. “Of course Jay Williams will pick UVA to win,” he thinks. Giving the home feed a final read before walking through the doors, he’s reminded that he’ll need his phone for the start of the game—it’s time to #LightUpJPJ. Jake’s at his seat and the countdown is on: five minutes to go. The teams are warming up, the music is loud and fans continue to fill the arena. The venue goes dark. An announcer tells all fans to take out their phones and open the UVA app. With their screens facing the court, the entire arena lights up with flashes of the team colors as the players enter the court. The music is loud. The fans are yelling and Jake and his friends are jumping; their blood is pumping—this is what game day is all about. Game day is about more than what happens on the court. It’s about the emotional connection a fan feels with the team. By giving fans an immersive, seamless experience—one that blends digital and physical touchpoints similar to Jake’s story—teams can ignite that sense of passion that lives within all fans. And while these details and touchpoints during the day may seem small, they add up, creating a remarkable experience that lasts a lifetime.